Cardiovascular disease is the leading cause of death in the United States. According to the Centers for Disease Control and Prevention, 735,000 Americans suffer a heart attack and 610,000 people die of heart disease in the United States every year. Additionally, Coronary heart disease (CHD) is the most common type of heart disease, killing over 370,000 people annually. Yet cardiovascular disease is often preventable. With careful attention to diet, an active lifestyle, and control of contributing factors such as diabetes, cholesterol levels, blood pressure, tobacco use, and weight, Americans can reduce their chances of facing heart disease, stroke, or other blood vessel disorders. Furthermore, advances in our understanding of how to treat cardiovascular conditions make it possible to reduce the disabling health consequences frequently associated with these disorders. 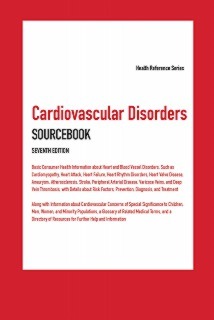 Cardiovascular Disorders Sourcebook, Seventh Edition provides information about the symptoms, diagnosis, and treatment of disorders of the heart and blood vessels, including cardiomyopathy, heart attack, heart rhythm disorders, heart valve disease, atherosclerosis, stroke, peripheral arterial disease, and deep vein thrombosis. It offers details about the conditions associated with increased risks, explains the methods used to diagnose and treat them, and offers suggestions for steps men and women can take to decrease their likelihood of developing these disorders. The book also includes a discussion of cardiovascular concerns specific to men, women, children, and minority populations, and it concludes with a glossary and a directory of resources for further help and information. Part I: Understanding Cardiovascular Risks and Emergencies describes how the heart works, explains the known risk factors for cardio vascular disease, and offers details about the conditions that make it more likely that a person will develop a cardiovascular disorder. It describes recent research regarding the genetic links and risk factors for cardiovascular disease, and it explains how to recognize a cardiac emergency and what to do when one occurs. Part II: Heart Disorders provides basic information about the types of disorders that affect the heart. These include problems with the heart’s blood supply, problems with the heart’s rhythm, heart valve disease, and certain infectious diseases, as well as heart attack, sudden cardiac arrest, cardiomyopathy, and heart failure. Individual chapters include information about the development, symptoms, diagnosis, and treatment of each disorder. Part IV: Cardiovascular Disorders in Specific Populations describes the unique ways that cardiovascular disease affects men, women, and children. It also offers some statistics on the occurrence of cardiovascular disorders in each of these populations, and it concludes with a discussion of cardiovascular disease among minority populations in the United States. Part V: Diagnosing Cardiovascular Disorders explains the methods used to diagnose disorders of the heart and blood vessels. It describes diagnostic tests, including blood tests, electrocardiography and echocardiography, angiography, stress testing, and Holter and event monitors, and it explains how to prepare, what to expect, and which risks are associated with each test. Part VI: Treating Cardiovascular Disorders discusses medications and procedures used to treat these disorders, including antiarrhythmic and anticoagulant medications, catheterization, coronary artery bypass grafting, stenting, pacemakers, and valvuloplasty. It also includes a discussion of aneurysm and heart defect repair, heart transplant, and the use of the total artificial heart. The section concludes with a discussion of cardiac and stroke rehabilitation techniques.